← Fine for Modi to make political hay out of Balakot. And why is abrogating Articles 370 & 35A such a big deal? Or, strengthening AFSPA? When contemplating the troubles India finds itself consistently running into at every turn in regional and international affairs, the question that repeatedly comes up but finds no answers is: WHY? It comes down to the inability of the Indian government — with PMO as the lead agency in the present dispensation and MEA as secondary player — to read the extant or unfolding international/regional reality, anticipate developments thereof, and to be prepared with ready choices and actions to minimize their ill-effects and, per chance, even advance the national interest. Instead, India is, to use an American ‘Wild West metaphor, like the perennial damsel in distress, always finding itself tied to the rail tracks as a train pulled by a heavy locomotive comes barreling down the track. What are the damsel’s or India’s options in this scene? Apparently, none, other than to holler for help and hope that some kindly soul or country will take pity and come to its rescue. In this case, the train is the US policy targeting Iran’s military and the only person who can help is the erratic President Donald J. Trump, driver of this policy. A couple of days back, the US government announced that it was sanctioning the Islamic Revolutionary Guard Corps (IRGC) — the Pasdaran, as a “foreign terrorist organization”. How idiotic is that? It’d be like the US sanctioning the Indian Army tomorrow! You can’t simply sanction a sovereign force and the US State Department and the Pentagon (for reasons adduced below) strongly opposed any such move. But Trump is like an elephant in a state of ‘mast’ — uncontrollable. In reaction, Tehran has declared the US Central Command to be a terrorist organization, meaning any Indian entity dealing with this American theatre military command will be in violation of Iranian law. Where such action-reaction madness will end is a fool’s guess. 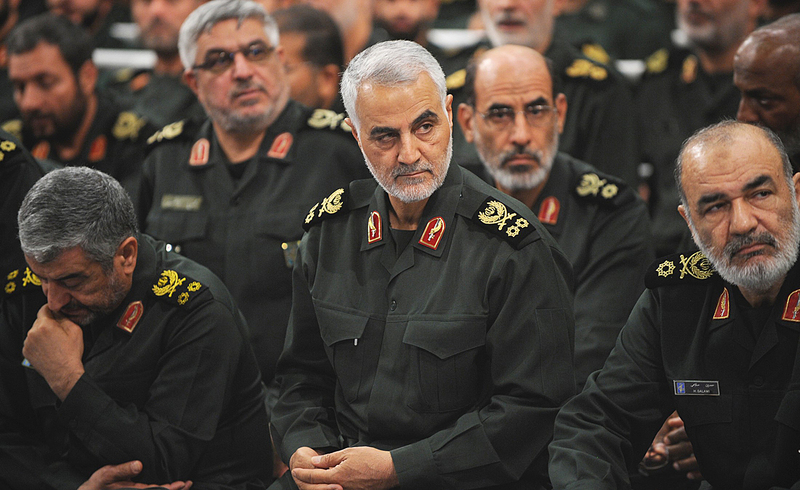 Iran’s main military force, Pasdaran, are divided into two wings the Quds Force for external actions and the Basij Militias for internal security. The US decision was made even though the Quds Force commanded by Major General Qasem Soleimani and the Quds-backed shia counter-terrorist Iraqi militias, such as Harakat Hezbollah al-Nujaba, time and again saved the goose of US Special Forces fighting the Islamic State, by concerting their battlefield actions with them. Indeed, in the decisive battle for Tikrit, the IS stronghold, while the US air force, as it is reported, bombed from the sky it was the Quds Force that swept the IS fighters out of their entrenched positions in the town. By US’ own official accounts, the combination of Quds and the shia militias was instrumental in the defeat of the Islamic state in Syria — an enterprise supported by the Assad regime in Damascus as well as by Russia (whose covert material involvement Soleimani managed with considerable aplomb). In fact, Pentagon officials are warning that the IS is far from wiped out in the Levant and without Quds’ active cooperative role, which the US military cannot do without, the IS will make a comeback, and that the US sanctions are, therefore, a political and military liability. So why did Trump do it? Because he doesn’t understand nuances and is the typical dull-witted and blundering ingenue on the world stage who will careen from one disaster to the next without being remotely aware of the damage he is wrecking. He, moreover, seems to have set ideas of enemies and frenemies (among whom he counts China but also India, incidentally, whence his frequent riffs on India’s unfair trade practices, etc.! ), and is otherwise led by the nose by John Bolton, his NSA. Bolton, in turn, has never made any bones about his intent to affect regime-change in Iran by indirect means because direct military action would run into the Pasdaran buzzsaw. The preferred means of the US government, in the event, from George W Bush’s presidency, have been sanctions, using them to slowly but relentlessly grind the economic life out of the shia state. Economic sanctions already imposed on Iran have pretty much snuffed out the country’s oil industry, its oil export revenue plunging to a low 13%, making Tehran desperate. As if the problem was not complicated enough, Bolton-Trump’s Iran policy is motivated also by the mortal enmity between Iran and Israel. The Quds Force is in the forefront of orchestrating terrorist strikes through its Hezbollah arm within Israel and against the Israeli military, and Tel Aviv has reciprocated in ample measure with relentless covert warfare especially to undermine Iran’s nuclear programme, which Israelis fear has progressed beyond the failsafe point, meaning that it has crossed the weapons threshold. Trump-Bolton have bought into this Israeli belief and are determined to deny Iran the safety of nuclear weapons. Modi’s hinting in his televised interview (News18) on April 9 about balancing intimate relations with Israel with close ties to Iran doesn’t quite protect India’s relations with either country from the punitive actions of the other and their respective coterie of friends and partners. Modi’s effusive reaction to Bibi Netanyahu’s reelection as Israeli PM for a 5th term only puts India’s ties with Tehran in stark contrast to US sanctions on the Pasadaran. Will, Tel Aviv, in its own interests and following on this episode and perhaps with a side-prompt from Washington, not begin coercively to use the US sanctions as excuse to hold off on technology and high-value weapons cooperation with India? So, where does India find itself in this melee? PMO run by NSA, Ajit Doval, plainly did not see any of this coming. But shouldn’t MEA have been sending policy briefs about what was cooking in Washington — assuming the Indian Embassy is even plugged into the scene , so that Delhi was not, once again, caught with its dhoti down? The PM who is his own foreign minister and defence minister and every other minister and, by his own reckoning, also his own best thinktank, seemingly knew little about this brewing storm, because in the above-mentioned TV interview Modi sanguinely described his success in the foreign policy field of, in effect, balancing relations with Iran with relations with the Gulf countries and Saudi Arabia. What he nowhere mentioned was how his government planned to deal with the US-Israel and/or Iran should Washington up the ante in its antagonism to Tehran as has just happened? The pat answer may be that the Modi regime has by now perfected its reactive stance — when Washington says jump, Delhi does the pole vault! Every time the US government tightens the sanctions tourniquet, Indian ministers, Doval and the like, run to Washington, not to caution the Trump Administration against foolhardy measures but to, what else, plead shamelessly for a reprieve, for the US cutting India some slack. On US’s demand, India has reduced the flow of Iranian oil to a trickle and mostly injured the Indian economy. And in reply to Trump’s harangues against India supposedly unduly taxing US exports there’s the standard avuncular assurance from Commerce Minister Prabhu that India has forwarded a comprehensive trade plan to the US. OK, but the Trump White House has not responded to any Indian trade plan and is not letting up, and American imposts continue to hurt Indian exports badly. The real reason Trump picks on India is because he knows India is no China, and Modi is no Xi, and will not react aggressively whatever the provocation. And that he can bully the Indian government into almost any disadvantageous deal his Admin can dream up just as long as he lets a few more Indian techies into the US under the H1B visa rules every time Delhi squawks — the metric that Modi, who appears to have a typical yokel’s fascination with glitzy America, has adopted to please the Indian middle class voter, and to retain whatever access he thinks he has to the Trump White House. Anyway, to return to the main topic, the Modi government is on tenterhooks. The growing security cooperation with Iran radiating northwards from Chabahar and India’s grand strategic design for reaching out to Afghanistan and central Asia, and even Russia and Western Europe via the land route, with the proposed Indian-built rail and road links connecting with the Russian Northern Distribution Network, is endangered. Because any security cooperation involves dealing necessarily with the Pasdaran, the Indian Army, Navy and air Force and intel outfits are all equally exposed to US sanctions under Trump’s latest initiative. Is anybody in the Indian government, including the extensive intel chains run by Doval, alive to this onerous situation just round the corner, and given it thought? Does Modi and his PMO, even less MEA, have the faintest idea of what India will do once any Indian armed service and/or intel agency in their normal run of things is identified by the designated Pentagon unit as having comported with the Pasdaran — a now sanctionable offense? Clearly not. So to return to that picture of the damsel in distress — consider the piquant scene. Modi will cry for help when the engine driver, Trump, is also the very person who has decided to run down the person tied to the rail track but is also, strangely, the saviour Modi expects will spring to India’s assistance! This entry was posted in Afghanistan, asia-Pacific/Indo-Pacific, Asian geopolitics, Central Asia, China, China military, civil-military relations, Culture, Decision-making, domestic politics, Europe, Geopolitics, Great Power imperatives, India's China Policy, India's strategic thinking and policy, Indian Air Force, Indian Army, Indian ecobomic situation, Indian Navy, Indian Ocean, Indian Politics, Intelligence, Internal Security, Iran and West Asia, Israel, MEA/foreign policy, Military Acquisitions, Military/military advice, Russia, russian assistance, SAARC, society, South Asia, Special Forces, Strategic Relations with the US & West, Terrorism, United States, US., Weapons, West Asia. Bookmark the permalink. India’s dependence on $150 billion software exports to mostly USA and the trade deficit with China, leaves India in a vulnerable position. India needs another $100 billion in exports to remove the threat of USA actions. There is no one low-hanging fruit that India has. But there are are some 5-10 alternatives which are bite-sized opportunities in the $10-$30 billion category. Including the defense aircraft, this is a $200 billion opportunity that India has been ignoring for decades. For starters India needs to just rationalize its customs duty rules and allow customs bonded warehouses for MRO companies. Getting $20 billion in revenues in this industry is neither difficult or costly. Africa already does as much with India as EU. Nearly $100 billion. There are numerous business opportunities in Africa that go abegging, coz Indian businesses are just too besotted with USA and EU. Increasing Africa business by $20-$30 billion is well within reach. With India being a major player in cement and steel, India’s ability to stich together viable Railway projects worldwide with value-for-money platform, can bring in $20-$40 billion. India’s overwhelming dependence on USA for $150 billion software exports leaves us very exposed. Add to this trade deficit with China. These are all great ideas, many of which, such as MROs, have been suggested by Niti Ayog but as ever, no follow-up. India is really not in position to perform any action without notifying US, even if that action is not concerned to US. The only option for india is to convince(somehow) US that it really need advance weapons from Russia and one more TN test to make sure that it can acquire some edge in relation with China, and can act as US ally (against china)when required.After all US is already aware that china sole motive is to take Top place in world. It is a question of priorities. India does not have the requisite weapons to be sovereign and thus must play the cards that are dealt to her. Currently two conditions are critical to India’s well being and survival. One is the US market and the other is Israeli weapons and technology. Israeli weapons have, in wars past, played a crucial role in maintaining the war efforts, especially against Pakistan. Hence, when push comes to shove, India must a) give up Iranian oil and b) forget Charbahar and Afghanistan. Sir, is there any possibility for lca tejas to get contract from Malaysia ?